Conch fritters are like Caribbean hush puppies stuffed with sweet, tender conch meat. Conch is “the” food of The Bahamas. Conch meat can be eaten many different ways: raw in salads, deep-fried as fritters, in chowders and gumbos, and even in burgers. 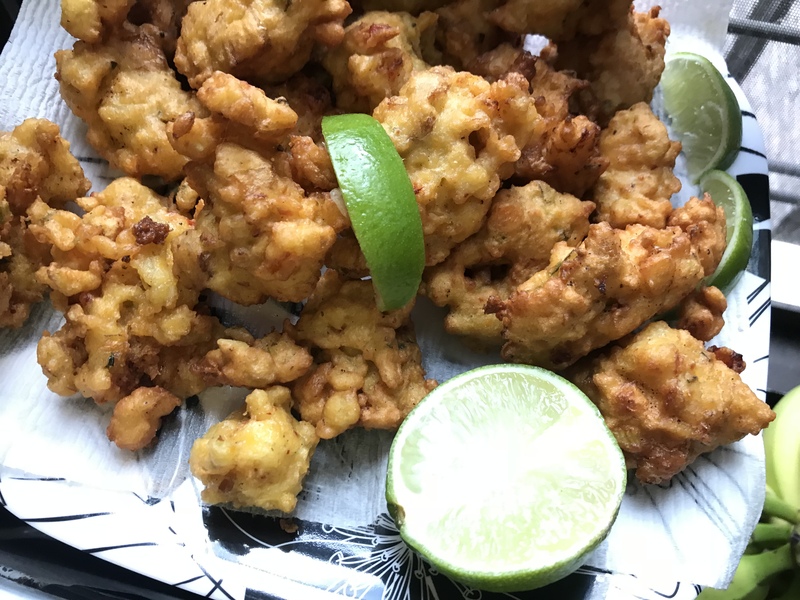 The humble conch fritter elevates the meat into an irresistible treat, crunchy on the outside and moist on the inside with tender morsels of conch. I add shrimp for additional texture and flavor, but you don’t need to. Mine recipe is a riff on the ones I got at a Caribbean place on Flatbush Avenue in Brooklyn served with tangy spicy sauce. You can by conch meat that has been cooked and cleaned already. If conch meat is fresh from the shell, soak the conches in salty water for several hours. Cut off any dark pieces of skin on the conchs. Use only the muscle of the conches for food. The digestive gland must be removed for the meat to be safe. Before you can cook conches, you must remove the operculum. The operculum is a shell-like covering that protects the conch and assists in locomotion. Cut it off with a knife. Tenderize the conches by pounding it with a mallet until it is smooth and the thickness you want. Chop up into small pieces or use a food processor. Heat the oil in large pot or deep fryer to 365F (185 degrees C). In a bowl, mix the flour, egg and milk. Season with cayenne pepper, Old Bay, salt, pepper and red pepper flakes. Mix in the conch meat, shrimp, onion, red & yellow & green pepper, celery and garlic. Drop the batter by rounded tablespoons into the hot oil and fry until golden brown. That looks perfect for lunch. Thanks for sharing!